After surgery in big toe to rid of arthritis,plates and screws used, I noticed immediately after surgery that my big toe is pulled to about the 1 o'clock position. When xrays were taken 4 days later it showed a fracture below the plate and screws. I had not even put any weight on my foot. Doctor wants to do another surgery to straighten the toe back to normal position. I think this happened in surgery and should have been fixed tben. Xrays taken at hospital. Not sure what the showed but I noticed the toe and thought it was probably the way it was bandaged but only thin gauze was between toes. your thoughts? Without the luxury of actually examining you and certainly without being able to your x-rays I am kind of in the dark here. Yes, your big toe has drifted medially and is considered over-corrected, but for the time being that is not necessarily a bad thing, for the following reason. In bunion surgery, after the bone work has been completed in many instances we slightly over-correct the big toe and then when we apply the dressing, we dress the toe in the over-corrected position. Why do we do this? Simply because over time and by over time I mean a couple of weeks, the big toe will tend to drift back into alignment with the first metatarsal bone (the bone behind the big toe) and the alignment will be close to normal. 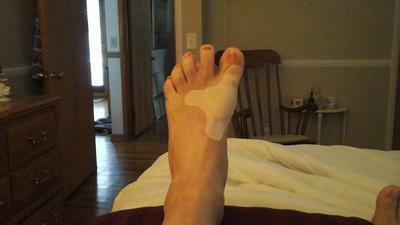 I am making the assumption that prior to surgery, your big toe was drifting towards the second toe. If, however, prior to surgery your big toe was straight and now it is pointed where it is, then that would be cause for concern. The fact that you had screws and a plate inserted suggests to me that originally the big toe was pressing towards the second toe. was over-corrected simply as a means to allow it to drift back into alignment, or, did the over correction occur as a result of a problem with the osteotomy which is the surgical breaking and re-setting of bone which then required a plate and screws. Since there is a fracture where the plate was applied and since your surgeon wants to go back in and repair it, then it would seem to me that the over-correction is from the fracture of the bone. Surgery is not without risks and fracture of a bone secondary to insertion of hardware is a somewhat common occurrence. Hopefully, you were made aware of the potential risks of this type of surgery, prior to the procedure. The last thing we as surgeons want to do is go back into a surgical site and do repair work, so if that is what your surgeon is offering you, chances are that is what will be required. If you trust your surgeon and he properly explains the problem and what he intends to do to fix it, then go with his advice. Since all of this is elective surgery, before you consent to further surgery, you always have the option of seeking a second opinion from a qualified surgeon in your area who can examine your foot and look at the pre-operative and post-operative x-rays to get a true picture of what is actually going on with your foot. Just to be clear, if the fracture is what is causing your toe to drift, then there is a good chance you may require surgical repair. On the other hand, if the toe is drifting because of intentional over-correction and the fracture is such that it will heal with nothing more then a cast and non-weightbearing for six to eight weeks you could wait and see what happens. Based on the information supplied to me, I have no way of knowing which is the case. No,doctor did not intend for this to happen, said he did not know why it drifted. Said I would need surgery to correct it. I feel like maybe I should get a second opinion. Toe was straight before surgery...full of arthritis and bone spurs pressing on nerves. Scraped and cleaned up the bones and fused. This was 3 weeks ago and toe is still drifted. Said he did not know how the fracture happened. Very unsure what to do at this point. Now I have a better understanding. You apparently had a first metatarsal phalangeal fusion as a result of a very arthritic joint. Yes, the toe should be straight and since it is not, it is due to the bone fracture. More than likely this will require additional surgery, but again I would have to see the xrays.